This article covers customizing the InfoWindow in WP Google Maps Pro. The features described in this article require WP Google Maps Pro. This article is based on WP Google Maps Pro v6. To customize the InfoWindow, go to WordPress Dashboard → Maps → Settings → InfoWindow. Resize Image: This toggles resizing all images to the sizes you set in the Width and Height Settings below. Default Image Width: Set the default image width in pixels. You can leave this blank and the max Width will be the InfoWindow width. Default Image Height: Set the default image height in pixels. You can leave this blank and the max Height will be the InfoWindow height. Max InfoWindow Width: Set the maximum width (in pixels) for your InfoWindows (the Minimum Width is 200px). Open links in a new window – Toggle this on to open links in a new window. Hide the address field – Toggle this on to hide the address field. Link text: Type the text you want to use for the Marker link in the textbox. 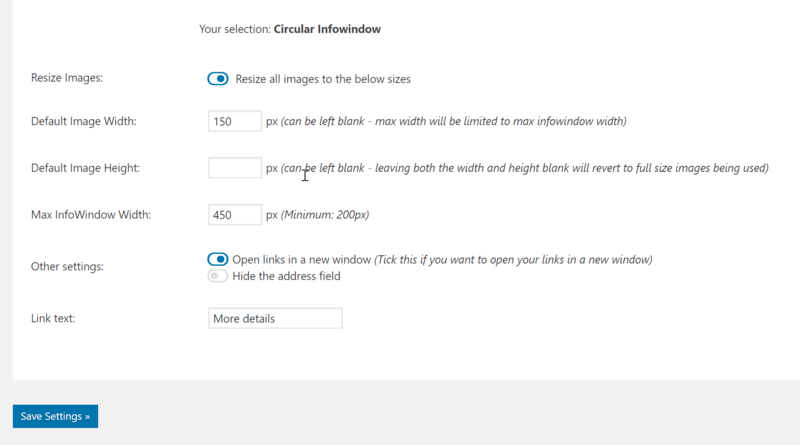 Once you’ve customized your InfoWindow to your requirements, don’t forget to click the Save Settings button. This article covered customizing the InfoWindow in WP Google Maps Pro. The features described in this article require WP Google Maps Pro. This article is based on WP Google Maps Pro v6. If you need further assistance or are having other issues with the plugins, feel free to visit our Support Desk.